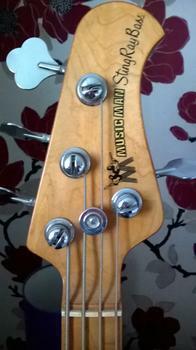 I modified the headstock of the P-Bass copy for better balance. Here are some pictures. And did the 10 grams of wood you removed make it balance better? have you noticed any difference in the sustain? @Marko1960, Yes, the balance improved. It's more than 10 grams I removed. In the last pic can be seen how it (just) doesn't tip over. @johnny, The sustain was good already. I optimized the neck to body joint a few months ago. What I noticed straight away, is a more snappy response of the E string. That was a positive surprise. I was thinking of doing the exact same thing with my old p-bass as the neck dives as soon as you put on a strap. The photos look great! I may need to use them for inspiration. Of course you can use the pictures. There's one condition, however, we wanna see pics of your modded headstok as well. Back in April I already inserted a coiled strip of lead behind the pick guard to improve the balance. I totally agree. Four years ago I discussed this matter with a German luthier. He considered a headless bass a win/win situation, because there are no dead spots or added resonances due to the head. ^ Yep. I played one in a music store. It feels kinda strange, but the tone is clear and I couldn't find any flaws at all.